1.Take off the transparent Cap cover on the Roller and electrify,First,insert the Attractant Strip,then put inside the Sponge to reduce the volatilization of the Attractant.finally,cover the Net Plate when the Roller running. 2.For the first time operation,fill 60-70ml warm water into the Spray Bottle(included), then close to Net Plate and spray 4-6 times.It will start drug reaction ( this process need about 30 minutes) , future use only need little spray,one day one time will be better.use tissue to dry the transparent Cap & edge to keep catching efficiency. 3.Insert the transparent Cap back into it's original track and lock.Place this Machine at where brightness and flies denseness,(note:the ray should point-blank into Sensitive Hole). 4.When the attractant strip use up,please mix the liquid following introduction. 5.Add little honey when mix the attractant strip to keep long shelf life. 6.Each Fly Catcher is effective for 50<?xml:namespace prefix = st1 ns = "urn:schemas-microsoft-com:office:smarttags" />-80m2 area. 1.When fill the Attractant,please take off the Transparent Cap & open the Net Plate. 2. 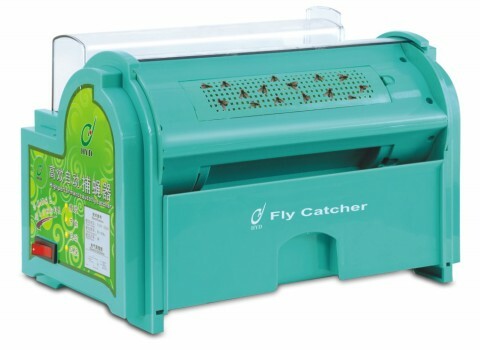 Due to the phototaxis of flies,this device should be located at bright place,and the surface of roller must be opposite to the light sideways. 3.Pls clean the Fly Collection box regularly & keep it dry. 4.The Transparent Cap on the roller should be inserted at right place & clean it via detergent to bolster up the efficiency. 5.Keep the motor from water & wet. Please immerse the Fly Collection Box into the water to fasten the death of the flies. To extend the service life of the Motor,continuous working time should be within 10 hours.